The Chimney Umbrella fits all square and rectangular flue sizes. Please see below for the range of Chimella sizes to match your flue. Measure inside the chimney SIDE TO SIDE & FRONT TO BACK at the narrowest part of the flue (usually about 600mm above the opening). FINALLY measure to the narrowest part of the flue from the top of the fireplace opening. This will help you calculate where to hold the CHIMELLA before releasing the canopy to the desired height in your chimney. CHIMELLA STANDARD – flue size between 200mm x 200mm up to 400mm x 400mm at a height of between 600mm and 700mm above the fireplace opening. CHIMELLA LARGE – flue size between 225mm x 420mm up to 450mm x 650mm at a height of between 600mm and 700mm above the fireplace opening. CHIMELLA EXTRA LARGE – flue size between 225mm x 650mm up to 400mm x 1000mm at a height of between 600mm and 700mm above the fireplace opening. 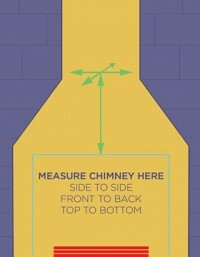 TIP > Counting the bricks can make it easier to find out the size of your chimney. A brick and mortar joint is usually 225mm long x 112.5mm wide x 75mm high.